Here are the watermelon socks on mom’s feet on Christmas day. I finished them at 11:41pm Christmas Eve while she was asleep in the guest room. sneaky sneaky! I didn’t weave in the ends on the afterthought heel just in case and it turns out I need to rip out a couple of rows as they are just a smidge too big. She really liked them, so I’m excited! I LOVE THEM! You are too much…these are perfect! 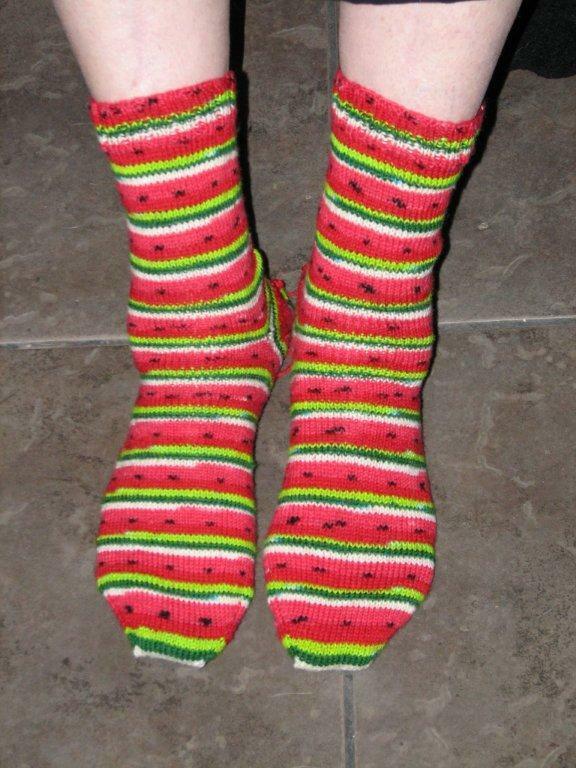 Those are great socks!! I too finished my Christmas knitting on Christmas Eve. My plan is to not do that this year! Happy 2012 Katie!